For the first time in the history of the World Youth Championships, the qualifying competitions to decide who would be the 16 teams to reach the finals were all carried out according to the same formula in each of the six Confederations. The CONCACAF eliminations (with Mexico taking part again) were held in Guatemala. The Mexicans gave some fine performances and qualified without losing a point. As a surprise in this group, Trinidad and Tobago qualified at the expense of the USA and so rehabilitated themselves to some extent for having lost unluckily to the same opponents in the 1990 World Cup qualifying round. But Costa Rica, who had been so convincing in qualifying for the 1989 WYC, failed to live up to expectation and were already eliminated during the group games. The draw for the four groups in the final competition marked the prelude to the final preparations for the World Youth Championship. Staged as part of a television show in the Estoril Casino near Lisbon, the ceremony was also attended by the legendary Portuguese footballer, Eusebio, who led his team unexpectedly to third place in the World Cup final competition in England in 1966. Trinidad & Tobago had a costly probationary period. Ince (no. 18) stretches out in vain - in the match versus the Soviet Union, the ball carries on flying into the net. This group, based in the historic cities of Braga and Guimaraes in Northern Portugal, contained two confederation champions, namely USSR (UEFA), Egypt (CAF), as well as Australia who had qualified from Oceania following a hard playoff series against Israel and Trinidad and Tobago making their first ever appearance in the finals as a representative of CONCACAF. The first game gave an indication of things to come when the USSR scored an early goal and prevailed against a fine Egyptian team. In fact Egypt had eight players who arrived on the day of the game after six days in Lisbon completing final school examinations. Hardly the ideal preparation for a World Youth Championship! The 1-0 result in the opening match was also reflected in resultant games involving the three strong teams in this group, USSR, Egypt and Australia. The surprising "Socceroos" won all their matches, scoring four goals and conceding none due to a fine defence well organised by goalkeeper Bosnich and sweeper Okon-Engstler. 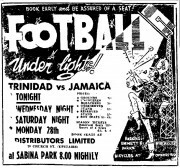 Trinidad and Tobago, as expected, had a tough baptism into the world of international football failing to score a goal whilst conceding twelve (12). the case against the USSR, and another fine defensive effort gave Australia the win and a place in the quarter finals with the injury-hit USSR team. The USSR qualified mainly as a result of the early win over Egypt but the champions of Africa can gain some consolation from the fact that they were eliminated despite scoring the most number of goals in the group and also their fair share of misfortune in the tournament. Trinidad and Tobago, despite being the weakest team in the group, are to be congratulated in that, in spit of being outclassed in all three group matches, they continued to practise the spirit of fair play, an encouraging feature of all the matches played in this group. The first team from the Caribbean Football Union (CFU) to play in a World Youth Championship, the Trinidad & Tobago team conducted an intensive preparation programme prior to their arrival in Portugal. The fact, however, that they were in a group that also contained the champions of Europe, USSR and Africa, Egypt as well as a strong Australian team made this a tough introduction into the world of youth football. The basic formation for the opening match against Australia was 4-3-3 but this was later modified to 4-4-2 when faced with other teams in the group that used at least four midfield players. 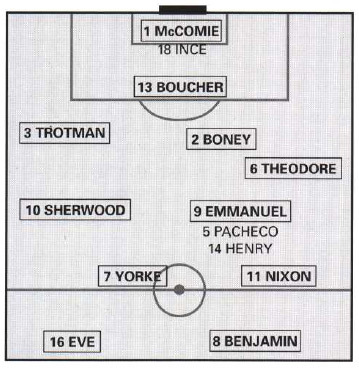 All the players with the exception of the goalkeepers, Michael McComie and Garvin Moze, were used in the matches, many in a variety of positions with resultant problems regarding tactical organisation, especially in the sweeper position in which Boucher and Boney alternated responsibilities sometimes in the same match. Trinidad & Tobago naturally lacked international experience. Their players tried to make up for this deficit with total dedication, just like Jerren Nixon in the match against Egypt. Technically the players were not as skilful as players in other teams, with the exception of Dwight Yorke. The ability to make and receive passes and execute technical skills at a high tempo often caused difficulties for the young Trinidad & Tobago players. Defensive qualities with regard to the marking and covering of players in both midfield and defensive thirds of the field were often exposed, especially in the match against Egypt. As a result of this fact that the team had to defend for long periods, attacks were too often based on long clearances out of defence that made great demands on the fitness of forward and midfield players. Dwight Yorke, the outstanding player in the team was also the catalyst in constructing attacks, when he played in midfield, but when his effectiveness was reduced, especially in the game against Egypt, the attacking potential of the team was also significantly affected. Antonio Sherwood also showed some technical qualities in midfield and Glen Benjamin showed some effective attacking qualities in the match against USSR, but the player with the greatest workload was probably goalkeeper Michael McComie, who had an outstanding game against Australia in the opening match. The Trinidad & Tobago team is however to be commended for its disciplined character and team spirit, and, apart from the unfortunate dismissal of Dale Boucher minutes before the end of their final match, played all their games according to the principles of fair play. It was an excellent experience for this island nation against three top quality teams. The challenge now is to use this valuable experience to ensure that teams return for future competitions at this and other levels of the game.